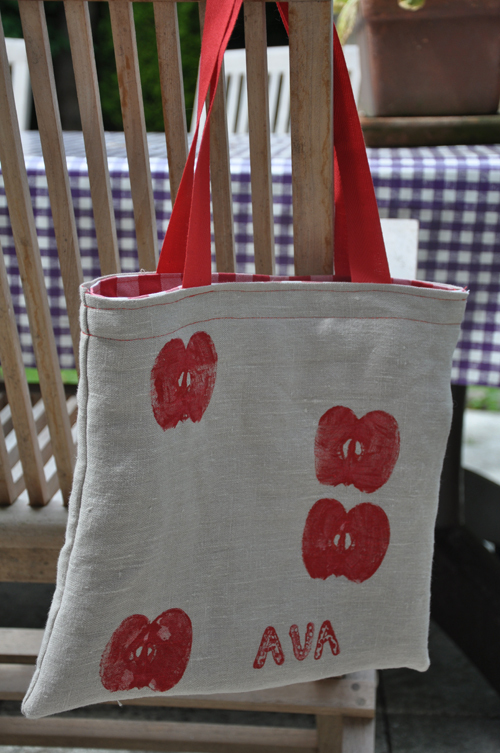 Apple stamping and tote bag making! Last May it was Sara’s 7th birthday, and she wished for a ‘sewing’ party with her girlfriends. I suspect this has to do with the craft night I organise with a few of my girlfriends every 2 weeks on Monday night, which involves tea and homemade cake and lots of chit-chat. Sara loves the idea of it — she always lies awake in her bed, waiting until my friends are here and secretly joins us for a bit of cake and some knitting before I put her to bed for a second time. 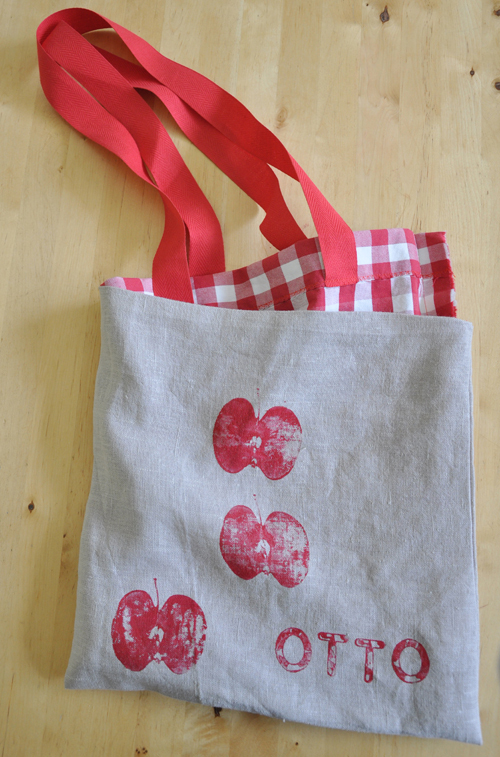 For her birthday party, I decided to apple-stamp tote bags with Sara and her girlfriends. I prepared the bag linings beforehand (up to step 4 below), and cut and ironed the outside of the bags in preparation as well. At the party, we let the girls stamp their own name and apple design first. 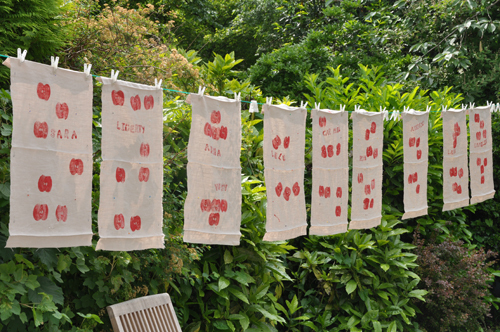 When the outside of the bags were drying (see photo) we played games and had cake. Afterwards, we let the girls sew the sides of the bags using Sara’s sewing machine (step 6 below). Nothing but two straight lines, but except for Sara, none of the girls had ever touched a sewing machine before, so this was a big success! I quickly sewed the lining to the outside of the bags so all the girls could take their personal tote bag home. 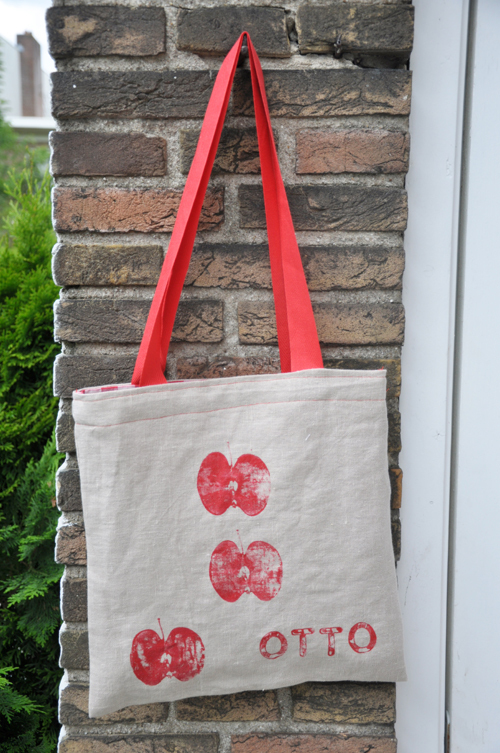 It was such fun to see all the tote bags the next day at school — used as gym, book or lunch bags! As for the making of — here is a quick how-to. 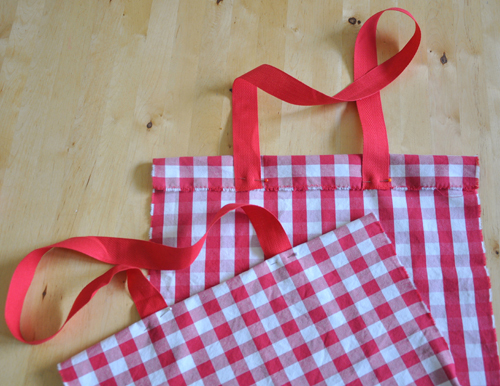 I used this twenty-minute-tote-tutorial from the PurlBee for the basic idea. 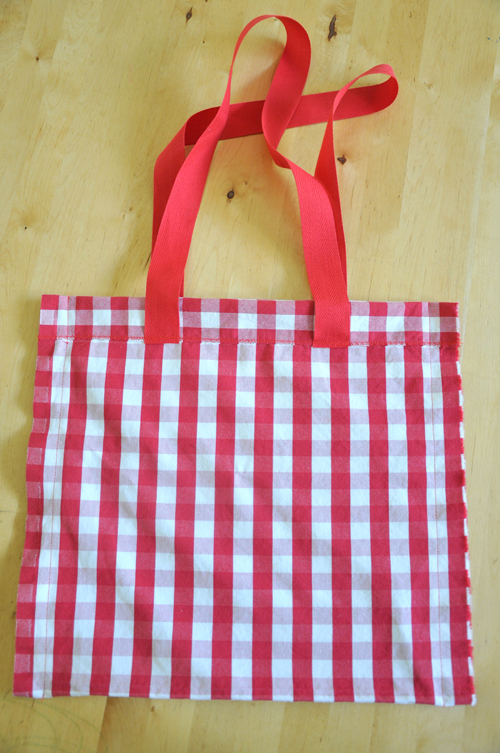 And in the meantime, I have been making more of these bags for personalised baby presents. Fun! 1. 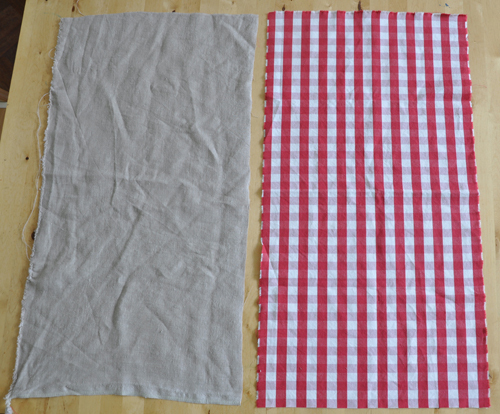 Cut out two pieces of fabric (pre washed and dried), one for the lining of the bag (I used Ikea Berta Ruta, which I had left over from the curtains I made for Sara and Pim’s room) and one for the outside (I used Ikea Aina linen). Each piece 35 cm (14″) wide x 70 cm (28″) long. You also need two pieces of 60 cm (24″) band for the handles. This I think is a good size for kids, but if you want them grown-up size of course you can make it all bigger! 2. Make the lining of the bag first. 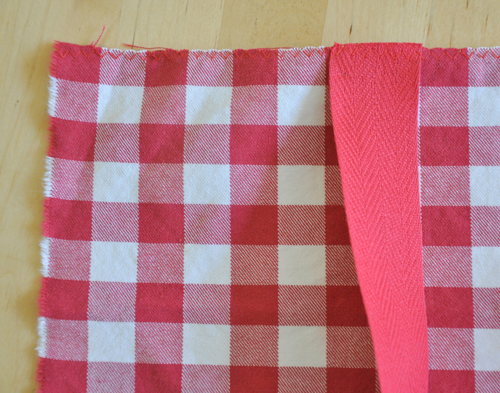 Stitch the handles to the short sides of the fabric using a zig-zag stitch — see picture — make sure the right side of the fabric is on the outside. 3. Sew fold on either side of the piece of fabric, thus creating the handles (so you’re folding them towards the ‘wrong’ side of the fabric). My fold was 4 cm (1 1/2″). 4. Sew sides of the lining together. You have now created the lining of the bag! 5. 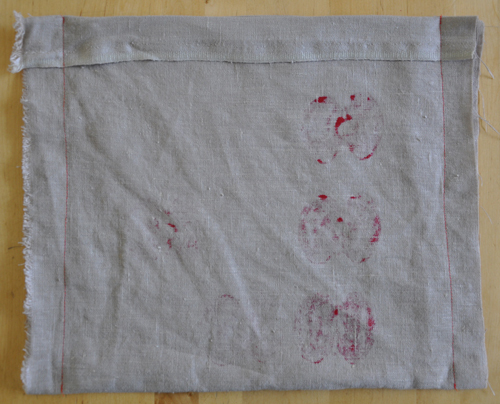 Stamp apples on the other fabric using fabric paint — make sure to stay away 3cm (1 1/4″) away from the long sides (for the side seems), and 5cm (2″) from the short side (fold for the top) and also keep in mind that one side of the bag will be facing up, and one will be facing down. 7. Insert lining into bag. 8. 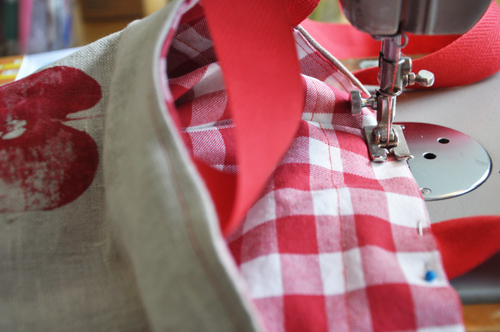 Sew the outside and inside of the bag together. 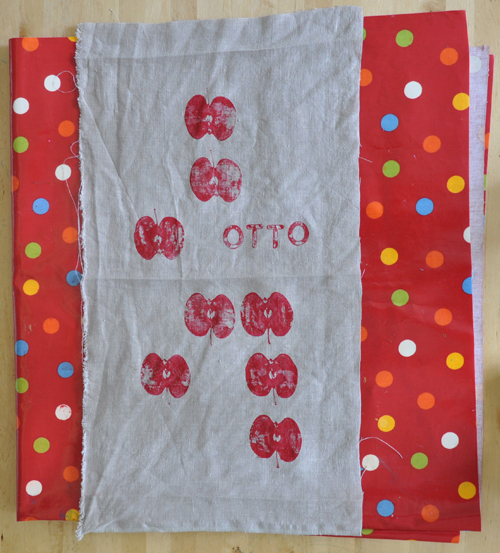 Hi, i have been using an apple print for my handprinted organic textile business for a few years now. I actually hand-carved a lino block to use for my continual print process though. 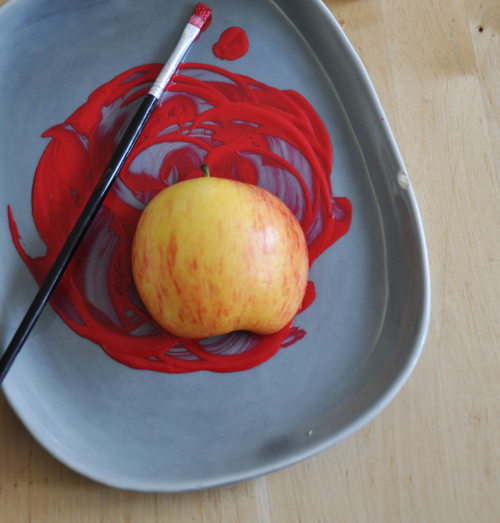 when i saw your red apples, i did a double take, as they are so similar. I also sometimes cut up other fruit too, and print with my son. you can also cut the apples across the middle and you get a lovely star snap that prints smack bang in the middle of the surrounding apple flesh! you are always so impressive with your creativity! Wow, these bags look great, w ill definitely try them out! 🙂 How long do you take on average to make the bag? What a wonderful party! Love the idea and the bags are so beautiful, I’m sure the girls were so proud! I woud love to throw a similar party to my little girl when she’s older.